Your signature represents who you are and what your role is at the company. Since Re:amaze is a collaborative helpdesk system, you may choose to have multiple staff or a single staff with multiple personas for multiple brands. Therefore, it's important to setup your signature before you start conversing with customers. To add a signature, click on the "Settings" tab and click on "Signature" under the personal settings block. You may write the desired signature here. Please note that the signature box accepts Markdown, a simple lightweight markup language. You can refer to it here. 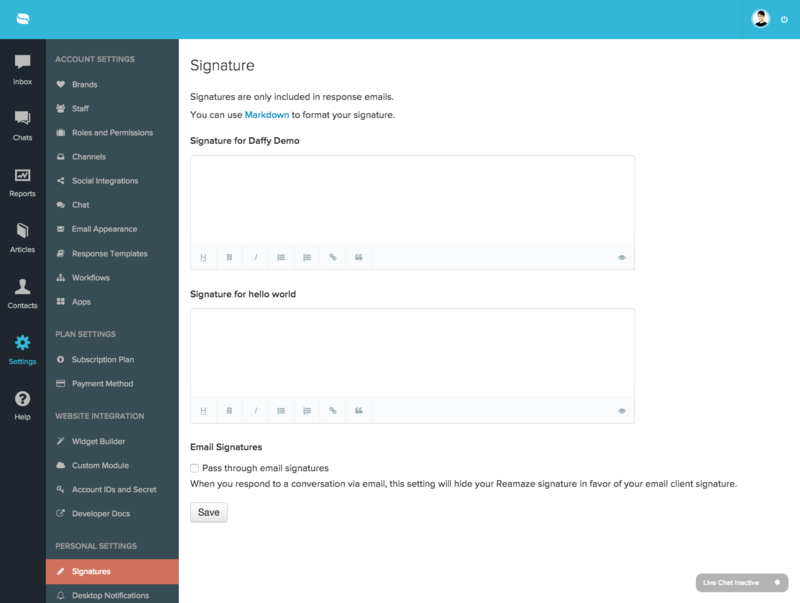 Signatures are appended whenever you reply to a message. Re:amaze will not display the sent signature in order to keep the UI clean.